You’re looking at a reproduction of a Stanley #113 compass or circular plane from KUNZ of Germany. 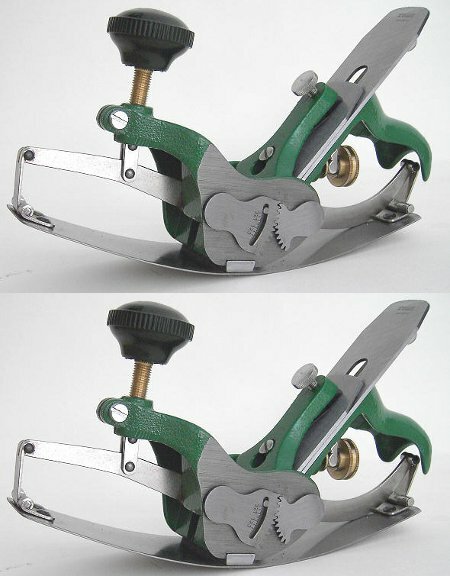 A compass plane has a rounded sole for planing curved surfaces. Some compass planes have a fixed sole, but others have an adjustable sole like the one above. You adjust the curvature of the sole to match the shape of the work piece, whether convex or concave (or possibly even flat, though why you’d want to is beyond me). The hand knob changes the shape of the sole via some cool levers and gears, and a dovetail connects the steel sole to the cast iron plane body. The entire plane measures 10-1/8″ from front to back and uses a 1-3/4″ blade. The whole thing runs about $300. Oh the fun of having to reset the blade every time you adjust the curvature. What’s the difference in the two pics? Record Planes (when they were an independent Sheffield England company) used to produce a compass plane as well. Both this and the Kunz are in my personal collection – and I think the old Record while of a convex-only design – cuts a better shaving. I suspect that the Kunz is based on an old Stanley design. What happened to being able to build something with your hands no power tools. you get the feel of the wood.Well I have a mechanical one nuclear powered and guess what it has a “LASER”. Kunz makes nice tools, and this looks like a decent copy of Stanley’s 113, but what’s with that hideous retro 1950’s hunk of plastic up front? If I’m dropping 300 bucks on a plane, I want a comfortable rosewood knob, or even a smooth metal one – something that says quality. Of course for 300 bucks I can shop carefully on flea-bay and get two 113s, set one up for concave, another for convex. you can typically find decent stanley 113s on ebay for under 150. In excellent shape, and 113 type 1 is barely 300 bucks. Sorry, Joe already mentioned that. I’ll be quiet now. Am I the only one that thought of this immediately upon reading the title to this post?